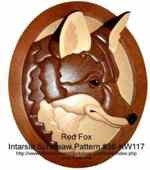 This Red Fox Head scrollsaw project makes a beautiful finished intarsia project. The designer of this project has included a few tips as well. The finished project measures 15 inches high by 12.5 inches wide and requires 29 pieces to complete. The plan does not include patterns to make the background or the oval.